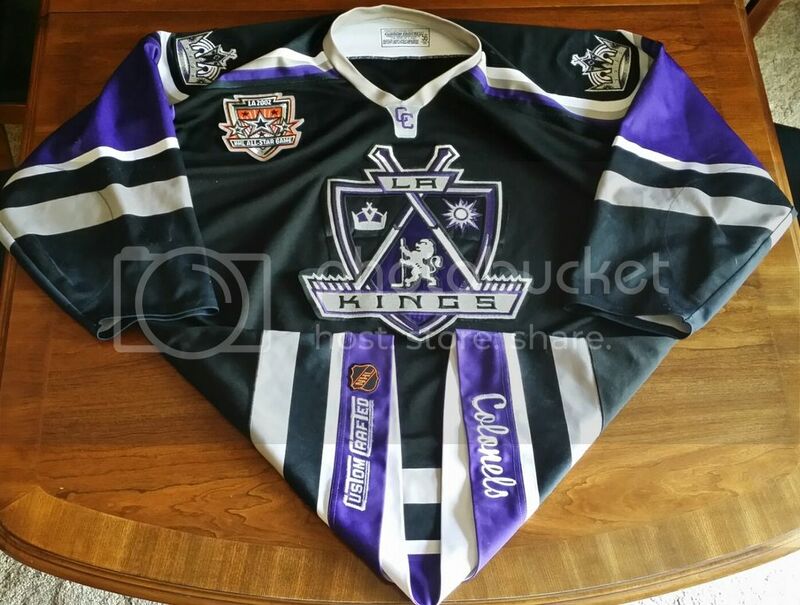 Does anyone have an authentic custom crafted jersey? Did they make these? I've seen the CCM Custom Crafted on Blues Shark Devils etc., but I'm referring to one that is branded and made solely by Custom Crafted. I have a Custom Crafted "Pro Action Knit" Albany River Rats training camp jersey. It's a knit kind-of like Ultrafil, but definitely not the same. It also does not have a fight strap, which I guess the AHL didn't require. I have an AHL Providence Reds throwback that's made by Custom Crafted and was used sometime around 1999. It's some of the strangest construction I've ever seen on a jersey. Imagine taking a blank red heavy practice jersey, then reinforcing the neck with twill. Of course you need stripes on the body, so those are either screened or sublimated onto strips of fabric, which are then sewn onto the top of the jersey. Then the old logo on the arms needs to be about five different layers of what feels like a heavy fabric paint. And finally, the trim is all screened on...except the name, which is not. I found this and got around to putting logos on it. I will likely add a fight strap. The AM patch too. It came all the way from NY today BUT the envelope was empty. And like Angelo said it's not ultrafil but it's heavy. I had it hanging to dry overnight then 2 hours in the wind in the morning to get it mostly dry.